To achieve 4bit DADC / "virtual MSO" Connect Arduino Uno to MCP4725, and latter to scope analog probe (1X). This gives approx -1.9V to 1.9V on scope. Fiddle with GUI to achieve readable visual. 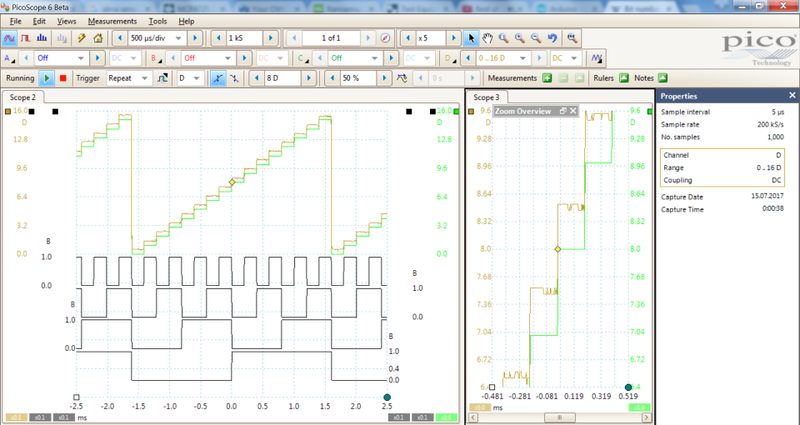 In this example discrete 0...15 test ramp is generated by Arduino. Actual usage would be listening to Arduino digital input channels converted to DAC output. Any other source/DAC can be used. Any PicoScope DSO, or other device having similar math capability can be used as listener. End result will depend on source quality, channel noise, channel bit resolution. In this case test was done in very high noise environment on 8bit PicoScope 2408B.